Eden Community (also known as Salamullah or God’s Kingdom of Eden) is a religious cult headquartered on Jalan Mahoni 30 in Senen, Central Jakarta, Indonesia. It is lead by Lia Eden, a middle-aged woman formerly known as Lia Aminuddin. Lia Eden claims to have had an encounter with the Archangel Gabriel, whom she refers to as the Holy Spirit, in 1995. Newspaper reports sometimes state that Eden at times has claimed that she herself is Gabriel or the Holy Spirit. She also says her son is Jesus Christ. Welcome to the Holy Throne of the Kingdom of Eden. This website — which belongs to the Holy Spirit, the Sovereign of the Holy Throne of the Kingdom of Eden — is the only website of the Archangel Gabriel that voices the Revelations from God the Lord of the kings in this era. His Majesty the Holy Spirit — an angel incarnate in Lia Eden — is represented in physicality by Lia Eden — Syamsuriati Lia Eden (Her Majesty the Sun Lia Eden), the Loyal and the Truthful. bringing God’s truth all over the world. Here I am now on www.liaeden.info. I am here with the people who’re willing to listen to news from heaven and the hereafter. I, Gabriel, the Messenger of God, have come. I deliberately reside on the internet as myself. Here I am speaking and telling what God has revealed to me. Give me way to penetrate the virtual world, until you know the wills of God Most Beautiful. Hey, don’t you all want to know about God from near you? Well, here it is, my website, the closest distance to God. This web site is created by God’s Revelation received by Lia Eden through the Archangel Gabriel. Lia Eden is a housewife and was previously a flower connoisseur. Her last formal education was Senior High School. 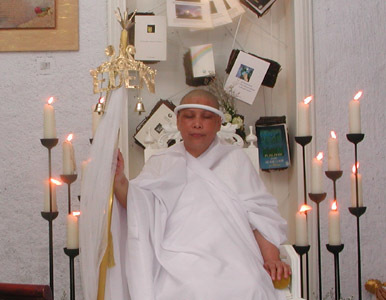 Born in Surabaya on August 21, 1947, Lia Eden has been constantly receiving guidance from Archangel Gabriel from 1997 to now. During the guidance, Archangel Gabriel has been purifying and educating Lia Eden through difficult tribulations throughout her life. That includes her controversial confessions which must be made publicly by the Archangel Gabriel’s command. The purifying process has been very hard and endless. During that time God declared Lia Eden as Gabriel’s mate, as prophesied in the previous holy scriptures. And God gave her a new name, Lia Eden, replacing the old name (Lia Aminuddin). And she is the one God has declared as His heavenly incarnate on earth. 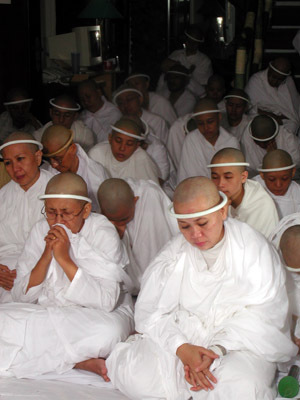 Though the Eden Community, which meets in a house named “The Kingdom of God,” claims to be multi-faith, the group is regarded by locals as – theologically – a cult of Islam. In December, 2005, thousands of locals surrounded the group’s meeting place. Police forcibly evacuated followers to prevent them from being attacked by the people, who claimed that Lia and her people were teaching heresies. In a move that many saw as unnecessary, Jakarta Police declared on Thursday Lia Eden and 32 of her followers suspects for defamation of religion a day after members of the cult were forcibly evacuated from their headquarters on Jl. Mahoni in Senen, Central Jakarta. Another 15 people also evacuated from the house by the police to prevent a clash with local residents on Wednesday were not named suspects because they were just participants in the gathering at the headquarters. Jakarta Police Insp. Gen. Firman Gani added the police would charge members of the cult, known as Salamullah, under Article 156a of the Criminal Code on religious defamation. Neighbors only become aware of the group after Lia, who claims to be the Holy Spirit, distributed flyers to her neighbors announcing that the house had become the Kingdom of God or Eden Palace on Dec. 5. Several other flyers, including a clarification on a report that the cult’s teachings were heresy and an invitation to President Susilo Bambang Yudhoyono to the house, were also distributed to houses in the neighborhood several times after that. “They never bothered or intimidated us before. Sometimes Lia’s followers went outside and we met them. However, they recently became active distributing several flyers to us. We just don’t like the content of the flyers. They should have kept their teachings to themselves,” Firdaus, 40, whose house is only 20 meters from Lia’s place, told The Jakarta Post. He said that they considered Lia and her followers strange people with a different way of thinking. Lia’s flyers, however, were responded to by members of the congregation of nearby Meranti Mosque, which also distributed flyers condemning Lia’s teachings as heresy, and asked residents to join a gathering in front of Lia’s house on Dec. 30. Lia, who this time claimed to be God’s messenger Gabriel, responded with new flyers on Dec. 25, threatening to take the lives of the Meranti Mosque’s committee members if they held the gathering.